There’s a big Michigan road trip in the works and one of our stops will be in the Little Traverse Bay Region. 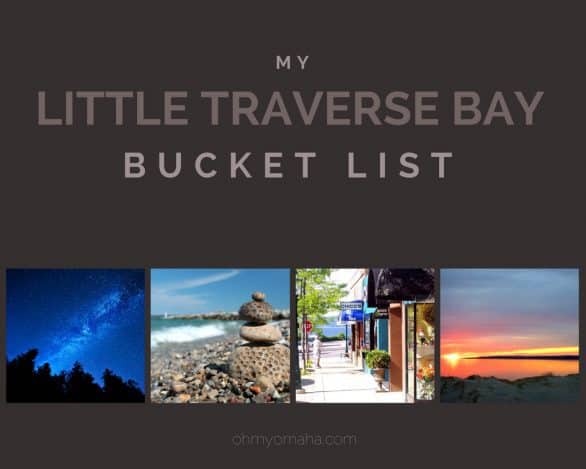 There are so many things to do and places to see, I’ve started a Little Traverse Bay bucket list. Given the itinerary of the road trip this summer, I get about 24 hours in the bay area – so this is a big wish list that will have to be checked off over additional trips. 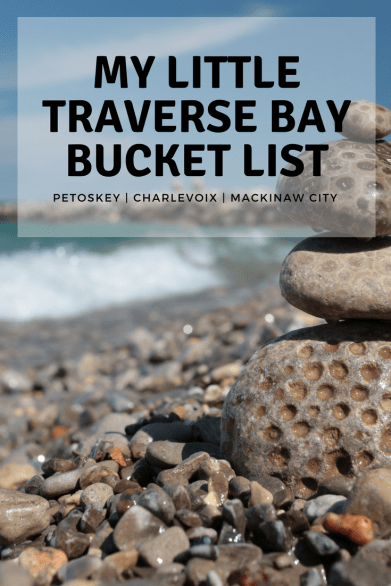 Here’s my Little Traverse Bucket List, featuring things to do in Petoskey, Charlevoix and other nearby cities. 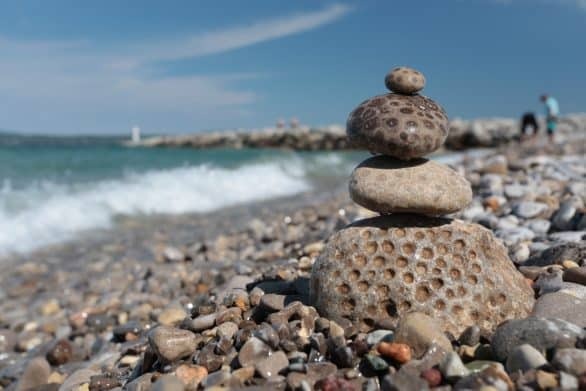 Find a Petoskey stone – I’ll fess up, these stones were the reason I looked into visiting Little Traverse in the first place. They’re so intriguing! The stones are actually fossilized coral that have a pretty distinct pattern on them. We can head to the beach of Petoskey State Park to hunt for them. 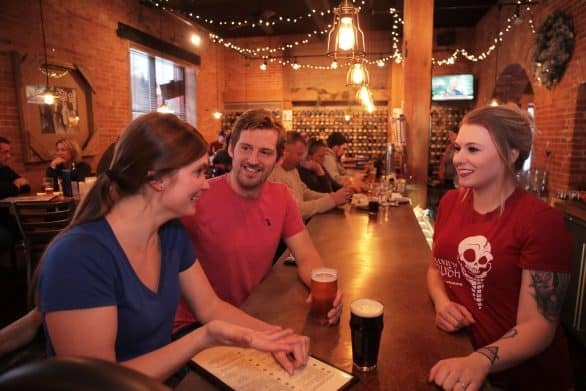 Taste local brews – I can’t resist a good microbrewery, and in Petoskey, there’s Petoskey Brewing Co. You know what sounds good on the menu (besides beer)? The Ultimate Fries: beer-batter fries topped with a melted three-cheese blend, chopped bacon and served with ranch dressing. The building has an interesting history. The building was opened in 1898 and was once known as the Old Brewery, serving Petoskey Sparkle beer until 1915. Do as Hemingway did – Petoskey has some legit Ernest Hemingway haunts. The historic City Park Grill dates back to the 1800s. Sit at the bar (second seat from the front) and you can have a drink where Papa Bear once sat. You can order the Hemingway Martini to complete the experience. Here’s a full tour of Hemingway’s Michigan. 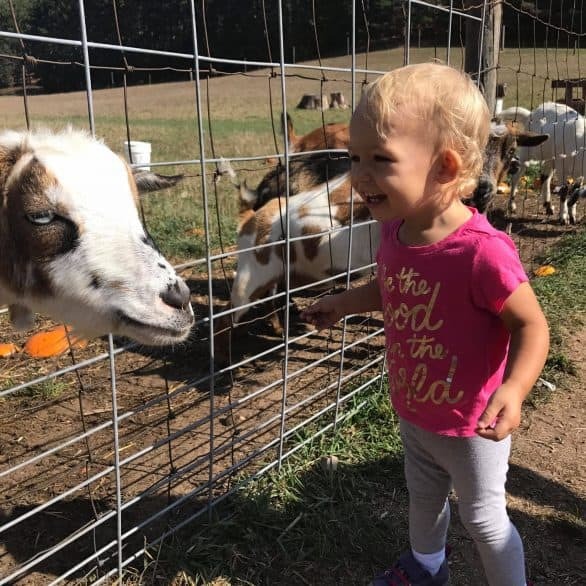 Pond Hill Farm – This sounds like a place that caters to everyone in my family: There’s a farm to feed animals, a hayrack ride to a trout pond, and a winery and brewery. 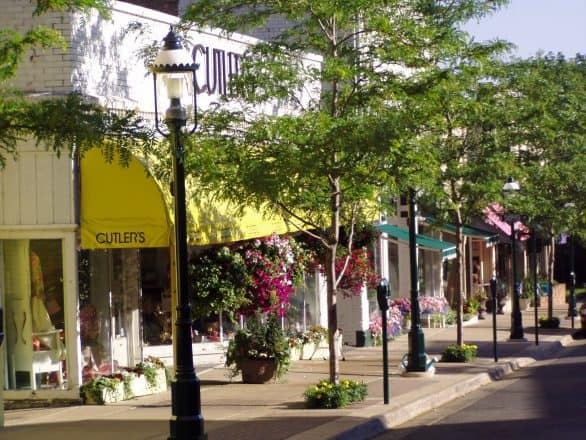 Shop the Gaslight District – Petoskey’s six-block Historic Gaslight District looks like a charming area to spend an afternoon shopping. American Spoon is located in the Gaslight District, where they sell artisan jams. A visit to Mclean and Eakin will be great too. 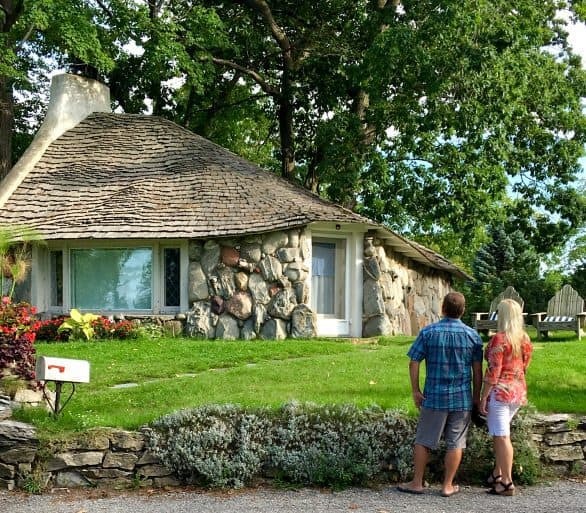 It’s one of the top independently-owned bookstores in the U.S.
Look for the Mushroom Homes – In Charlevoix, there are 26 homes that look like they’re straight out of a fairytale. Designed by Earl Young, these Mushroom Homes are privately-owned, but you can get a self-guided driving tour brochure from the chamber of commerce. See a show – If my road trip started a little later in the summer, I could catch a performance at Great Lakes Center for the Arts. 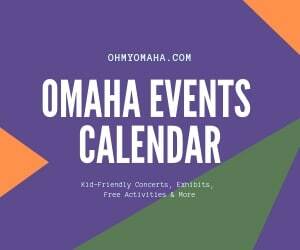 The first show of the summer season is July 7, 2018. Since it’s a bucket list, I can wish for the impossible (my rules), so I’d have tickets to the already sold-out performance of Pink Martini. Love that band! 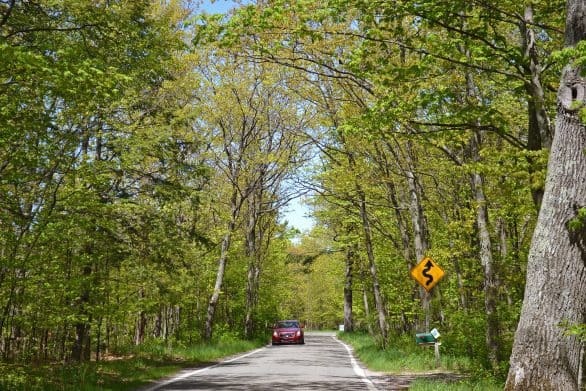 Drive the Tunnel of Trees – M-119 got the nickname for obvious reasons, this well-known 20-mile route ends at a state park said to have beautifully-colored stones to discover. 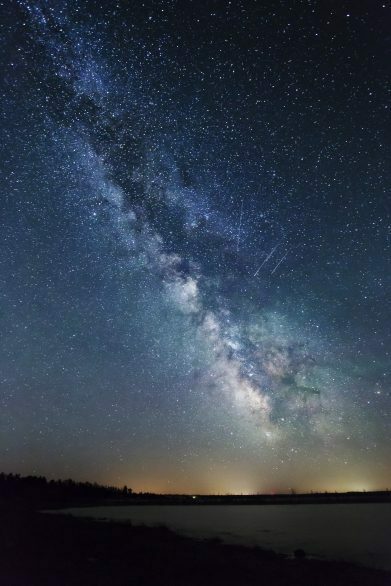 Stargaze – Skies don’t get all-too-dark in a city, so rare is the chance to find something like stargazing like I could at Headlands International Dark Sky Park (the ninth in the world!). Located in nearby Mackinaw City, it’s free to visit, day or night. 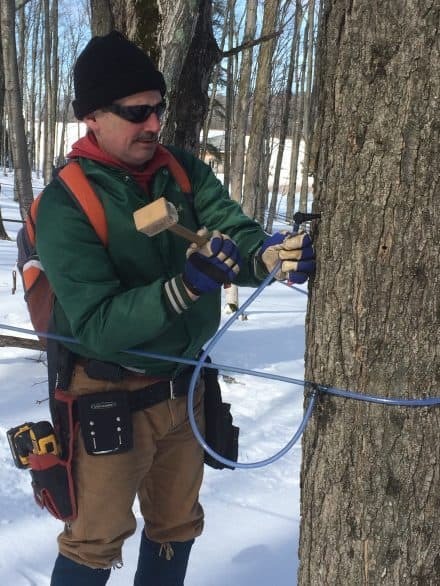 Maple syrup tour – The Little Traverse Conservancy offers a variety of events year-round, including a chance to visit Parsons Farm and taste the Hardwood Gold Maple Syrup. The Parson family opens the taps during the event, and just maybe, those on the tour get to taste the maple. I was fortunate enough to grow up and spend most of my adult life there. You should check out historic Bay View, have brunch at Stafford’s Bay View Inn, go to Burt Lake State Park for swimming (water is warmer than LTB and shallower, with no undertow). Instead of Petoskey Brewing Co., try Beards Brewery in downtown Petoskey, with a great view of the bay. You want an excellent burger? Hit Mitchell St. Pub in the center of downtown or Tap 30 nearby. Feel like fresh fish? Bob’s Place in Alanson has an amazing Friday Night Fish Fry. Other places to see: Mackinaw City/Mackinac Island/Historic Michilimackinac. The island alone is amazing. Like I said, I was fortunate to live there. There are so many hidden places, I could write a book in the comments. Enjoy your trip to LTB! Hi Joseph – Thank you for these tips! 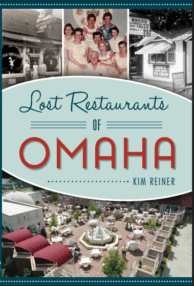 I love getting a local’s perspective on a place.